Bob Odenkirk, Jonathan Banks, Michael McKean, Rhea Seehorn, Patrick Fabian, Michael Mando, and Giancarlo Esposito. Like its predecessor, the story of Better Call Saul is the story of a process: This time, the transformation of ethically compromised attorney Jimmy McGill (Bob Odenkirk) into criminal accessory Saul Goodman. But perhaps even more than Breaking Bad, Better Call Saul loves depicting process. A motif in the first two episodes of the series’ third season finds characters taking things apart or putting them back together again, always with a meticulous attention to detail. An automobile is stripped to its bare components. Batteries are inserted and reinserted into devices, one scene going so far as to capture the awkward and never intuitive process of opening a plastic blister pack of C-cells. The elder McGill brother, Chuck (Michael McKean), instructs Jimmy on the proper method to remove an adhesive from a wall without damaging the finish underneath. We later see Jimmy taking tape off of a different wall, following Chuck’s technique for a few seconds—before finishing the job with one violent yank. If there’s any reason to feel anxious about Better Call Saul at this point in its run, it’s the thought that season three will represent that violent yank writ large. There’s every reason to believe that showrunners Vince Gilligan and Peter Gould will continue to practice a sense of composure and control as Jimmy’s chickens come to roost. But the biggest, most dangerous rooster in Albuquerque hangs at the fringes of season three’s first two episodes, and depending on where you stand on seasons three and four of Breaking Bad, this is either cause for celebration or a time to brace for impact. 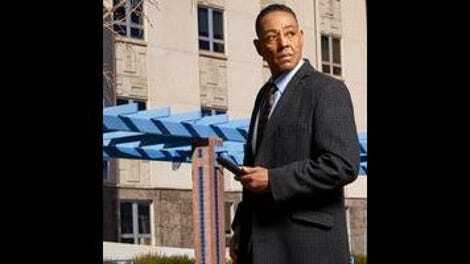 As foretold in the internet’s most storied acrostic, Gus Fring is back. Here’s the thing: Gus is a compelling villain, played with unsettling intensity and unnerving calm by Giancarlo Esposito. Fans of stern pronouncements laced with unbelievable malice are right to cheer the return of the man who runs his methamphetamine operation with the cleanliness and efficiency of a fast-food chain. But his re-emergence—or, really, emergence, within the Jimmy McGill chronology—suggests that the slow-motion car crash of Better Call Saul is about to gain a significant amount of speed. For the time being, Gus is just a familiar yellow dress shirt whose Los Pollos Hermanos restaurant serves as a new wrinkle in the private war Mike Ehrmantraut (Jonathan Banks) is waging against Hector Salamanca (Mark Margolis) and the Juarez cartel. But we already know that Gus is harboring his own grudge toward the cartel bosses, one that will reach a bloody, fiery conclusion during the events of Breaking Bad. For two years, Better Call Saul studiously skirted anything as hefty as an appearance from Esposito. Winks toward Breaking Bad were made, and minor players like Hector and his nephew Tuco were re-introduced, but there was nothing like the sharp elbow to the ribs that is season three’s first taste of Los Pollos Hermanos. Better Call Saul was—and for the time being, is—its own distinct thing with its own distinct cadre of characters whose moral quandaries felt of a piece with, but not necessarily beholden to, Breaking Bad. These people are still around, and they still have a part to play in season three: Rhea Seehorn as Kim Wexler, her own ambitions and sense of right and wrong increasingly torn between her feelings for Jimmy and the drip-drop of information about his wrongdoings. McKean is doing career-best dramatic work as Chuck, whose maniacal quest to catch his brother in the act might finally be having a greater impact on his mind than electromagnetic fields. In a welcome development, Brandon K. Hampton seems to be getting more screen time as Hamlin, Hamlin & McGill gofer Ernesto, the squeeze of the McGill cold war expanding his role from go-between to man who knows too much. But a figure who looms as large as Gus does has the potential to blot out the suns of these and other supporting Better Call Saul players. To their credit, Gilligan, Gould, and crew appear to understand this—but it’s incredible how Esposito can pull attention and create a sense of dread when he’s just the blur in the background of a tight shot on Jonathan Banks. (Those yellow shirts really are a masterstroke of costume design.) But Gus also has the gravitational pull to draw Mike—who grew increasingly adrift from the primary action in season two—back to the core of Better Call Saul. Sure, that storyline’s mostly silent Death Wish remake provides Banks the opportunity to act with his eyebrows and fiddle with instruments of death and surveillance, but it so often feels connected to Better Call Saul only because it’s connected to Breaking Bad. That’s all you can ask from a prequel, but this prequel is worth watching because it asks more of itself. And the amount of jailhouse imagery in the season three advertising campaign, coupled with the trajectory of the two episodes screened for critics, suggests that Jimmy’s and Mike’s paths will continue diverging. But there is this force that we know unites them in the future. The worst case scenario for season three of Better Call Saul: The show gets hijacked by a charismatic fan favorite. Best case scenario: That charismatic fan favorite turns out to be more like the tape on Jimmy’s wall and less like the process used to remove it, holding things together while Jimmy falls apart.